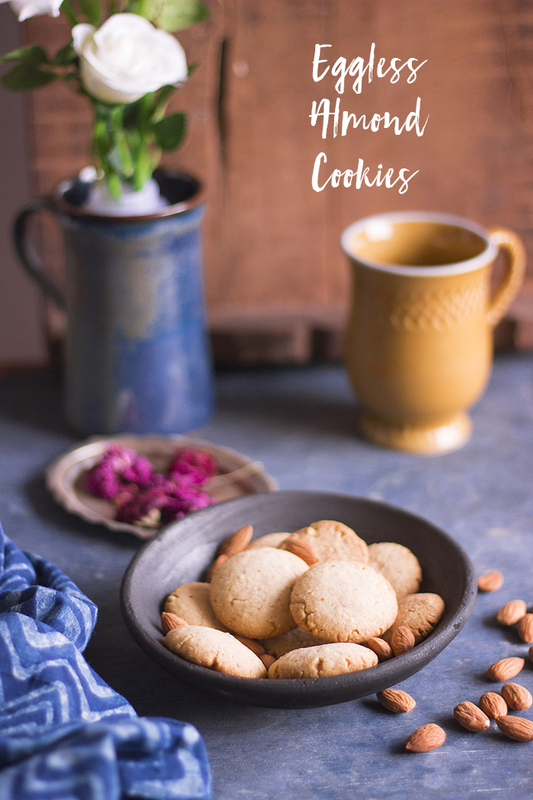 Eggless Almond Cookies or Badam Biscuits. 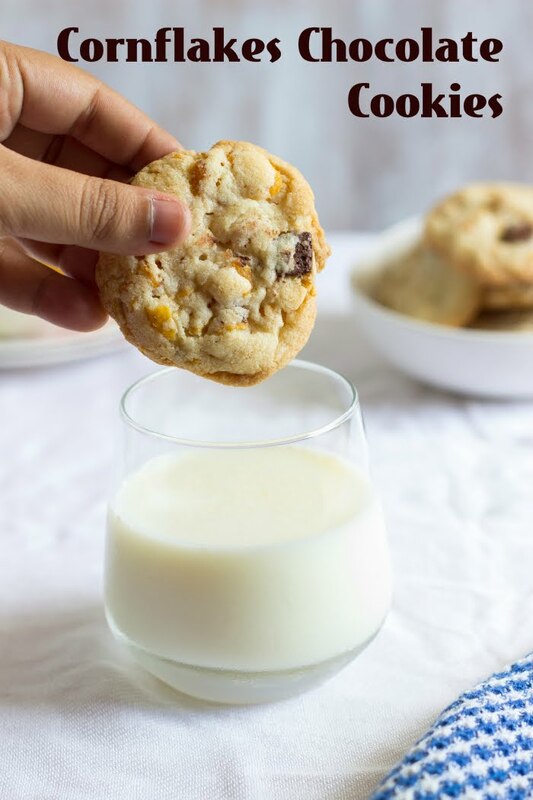 Crisp buttery cookies made with almonds. These Almond Cookies guys.... are the best cookies EVER!! 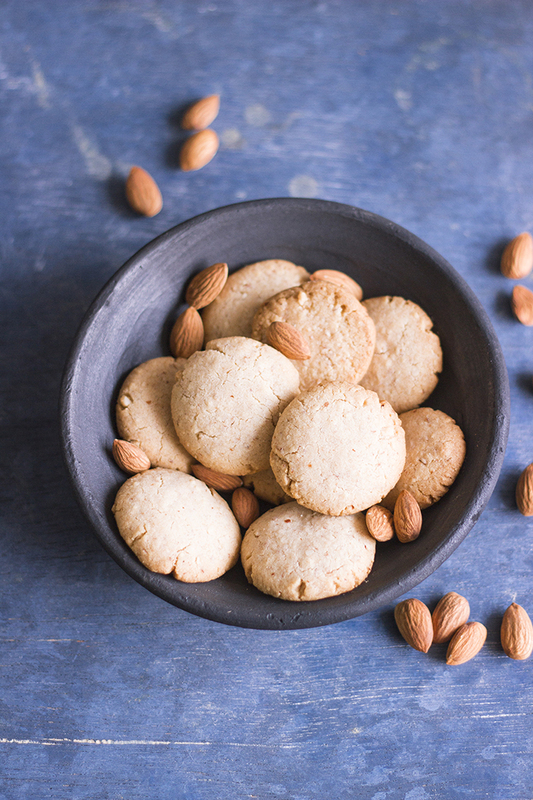 I've baked several cookies over the years, but it is to these almond beauties that I keep going back. These were the first cookies I ever baked and posted. 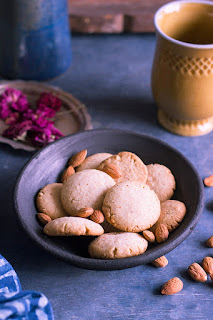 Today I'm just reposting the exact same recipe, nothing to fault there, with new photos and a video to make it easier for you to bake these almond cookies. Now you have absolute no reason not to. Right? I would have never got around to baking anything if it weren't for a quarter packet of unsalted butter staring at me every time I opened the fridge. Frankly, I can't even remember why I bought that butter and when I used parts of it. I've been racking my brain but got nothing so far. So because I was actually bored of seeing that butter in the fridge, I decided I need to bake something. I had excess almonds available, so I got around to baking these oldies again. Making these cookies is very very easy. All you need is 7-8 ingredients at room temperature. 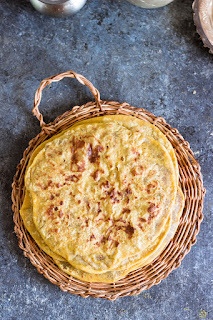 I use a mix of maida or all purpose flour and atta or whole wheat flour, just because I stay a little far from all purpose flour when I can. If you like you can use only all purpose flour or only whole wheat flour. The whole wheat flour here adds to the nuttiness of the cookie and is pretty much unnoticeable. I coarsely ground the almonds, you can also chop the almonds or add extra chopped almonds to give it a more almond-y taste. I plan to add the chopped almonds next time. The important thing while baking cookies is to not over-mix the mixture. Over-mixing will give you harder cookies, so mix everything until just combined. Also, don't overdo the creaming of the butter, it is a cookie not a cake, so don't incorporate a lot of air in there. I made one batch with the full 100 gms of sugar and found it a tad too sweet. Hence, here in this recipe, I added only 3/4th of the sugar first and then added more as required. It is recommended to chill the cookie dough before baking as it prevents the cookie from spreading too much. If you are short for time, freeze it for 15 minutes. This cookie dough did not slice well for me as it had almond pieces, so I rolled them instead of just slicing the dough. Once all that is done, just bake the cookie until it is slightly browned on the sides. When you remove the cookies out, they will feel soft, allow them to cool and they will firm up. 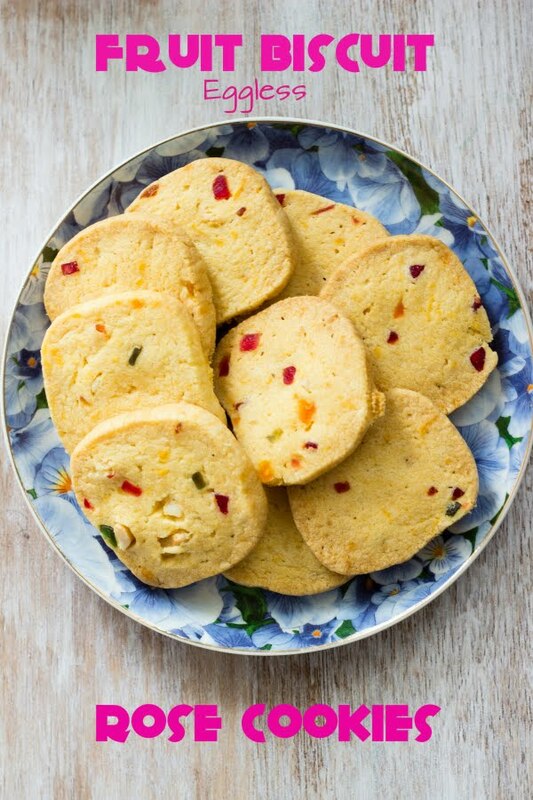 These Almond Cookies are crisp and not chewy. They taste great when dunked into a hot cup of chai. 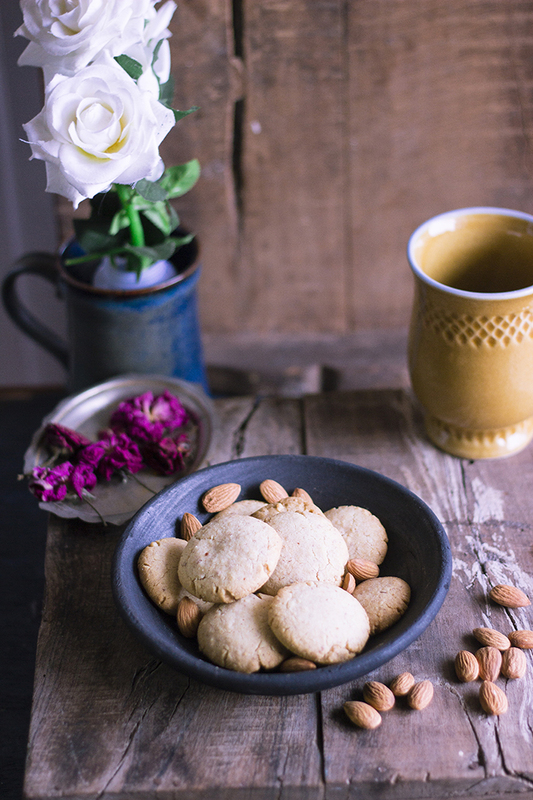 Don't you just love dunking your biscuits or cookies in chai? So I'm off to eat my cookies with chai. 1. Powder the sugar until fine. 2. Coarsely powder the almonds. 3. Take unsalted butter that is at room temperature into a large bowl. 4. Add in 3/4th of the powdered sugar and whisk until the sugar has mixed well and the butter is creamy. 5. Sift in the flour, whole wheat flour and baking powder. 6. Add the powdered almonds and vanilla essence and knead until combined. If it is too dry, add a little milk. 7. Taste the dough and add in more powdered sugar if required and knead again until combined. 8. Wrap in a plastic wrap and chill in the refrigerator for 30 minutes. 9. After 30 minutes, divide the cookie dough into 35 equal parts. 10. Preheat the oven to 180 degree Celsius. 11. Shape the cookies and place on a greased baking sheet. 12. Bake for 15 to 18 minutes until the edges are slightly browned. 13. Remove from the oven and cool on a wire rack. 14. Store in an air tight box once completely cooled. 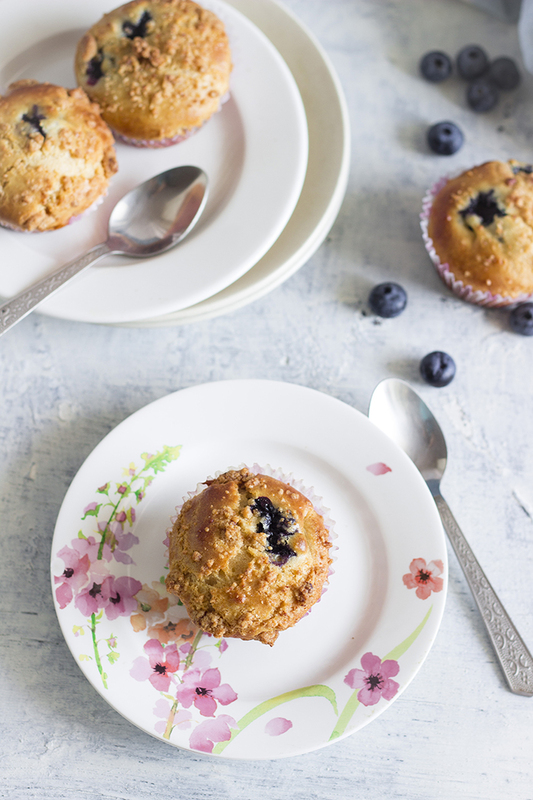 This is the ONLY recipe you will ever need for Eggless Blueberry Muffins! Moist, dense and basically just perfect, these Blueberry muffins will win over your loved ones. These Blueberry Muffins got voted Number 1!!! Seriously!! By my biggest food critic, my sister. I've got a perfect sister. Don't get me wrong, I'm not calling her perfect (after all only one of us can be perfect, and I'm the "one"), but that she plays her part of being the older sister perfectly. When we were younger, the 5 year age gap between us seemed so wide. I annoyed her incessantly - I followed her around, I copied her all the time. I had to have the exact same dress she bought. I loved using her stuff. I basically just wanted to be her. Then we moved to a phase where I think neither could stand the other very long - we had millions of wars, some could pass off as world wars. And then overnight, we became the best of friends. Just like that. We knew what the other was thinking, we did not even have to finish our sentences. The age gap seems non existent now. Back to the perfect sister bit - she smothers me with love, she's always been protective but she's also annoyingly critical. So when she ate these Blueberry Muffins and she ranked number 1 on her list of favorite baked desserts, I was super excited. And I knew I had to share it with you guys. 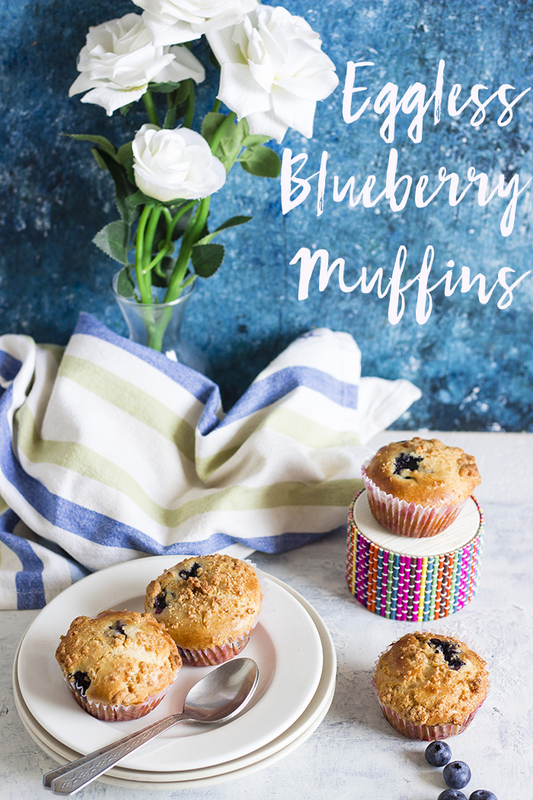 Wouldn't you want to try my number ONE Blueberry Muffins? 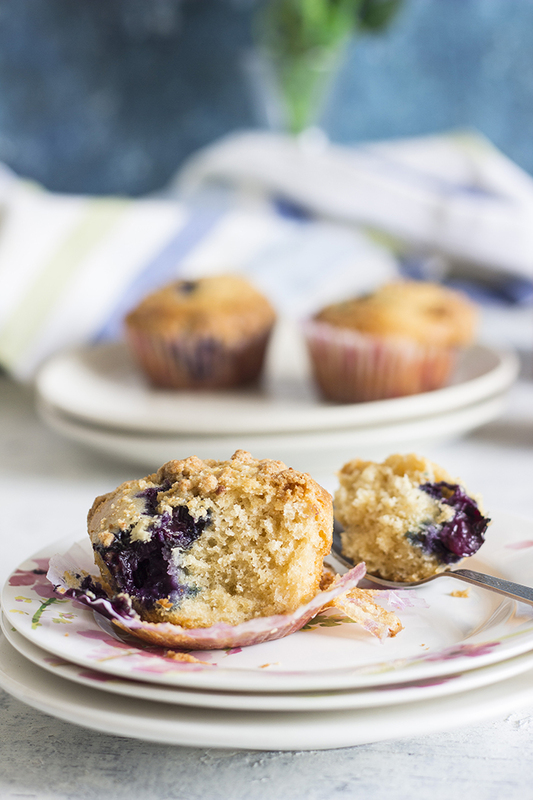 And it is the perfect season for these muffins. Spring is in the air, the freshest and plumpest of the berries are making their way to the markets. This isn't really a new recipe. I actually made these muffins for the first time 5 years ago and then for some reason, never made it again. I've had it on the blog for the past 5 years with sad little photos that did not make justice to the deliciousness of these Blueberry Muffins. Back then I had used canned blueberries as I could not find fresh ones. But this time it was all fresh fruit in my muffins. I have to say, the fresh ones triumph over the canned ones any day. I got these wonderful berries for a steal at Namdhari's Fresh. They were on sale for almost half the price. So if you are based in Bangalore, check out your closest outlet and they may still be available at that price. 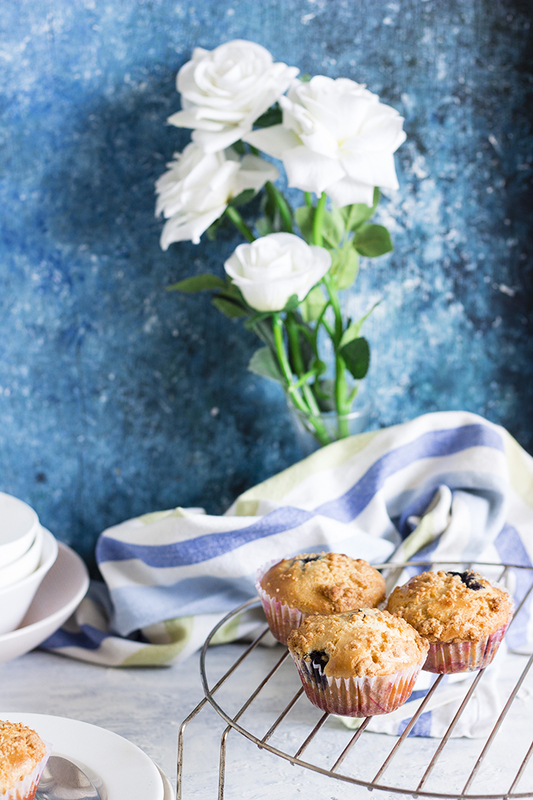 These muffins are vegetarian and are baked without using egg or egg replacer, yet they were moist and perfectly dense, just as muffins are meant to be. 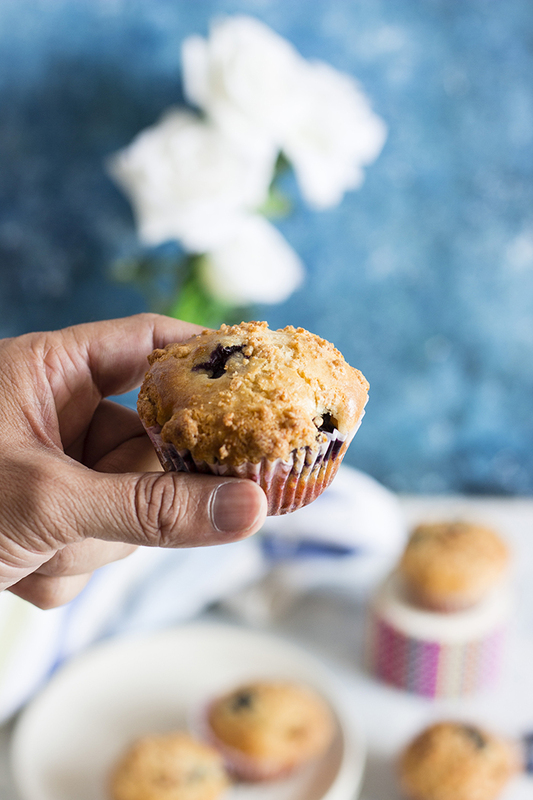 I topped these muffins with a simple streusel made from butter, vanilla, white and brown sugar which is totally optional but definitely recommended. Also, in the video recipe, you will see a small difference in color in the wet ingredient mix, this is because I made these muffins twice, once with melted butter and once with oil. And I kinda messed up a part of my video when I made them with butter, so I had to re-shoot that part of the video when I remade the muffins with oil. You can use either butter or oil, but I highly recommend butter, as it adds more richness to the muffins. 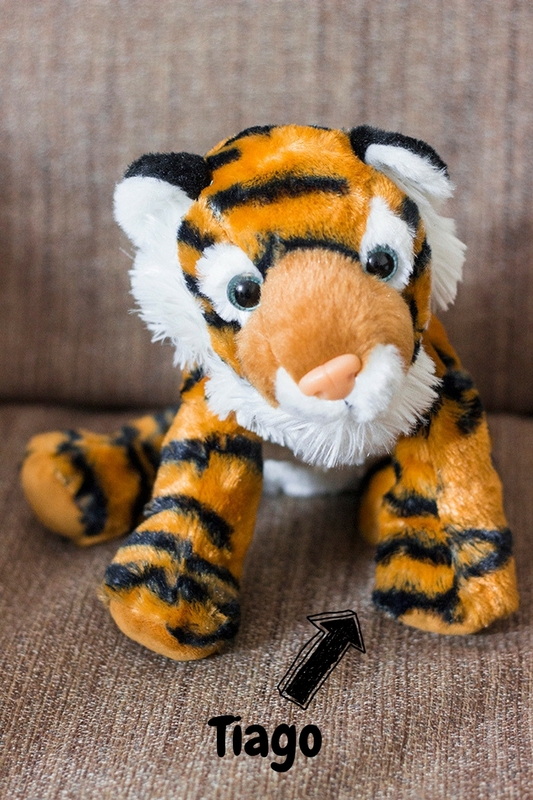 Psst... Want to know what else made it to Gee's list? 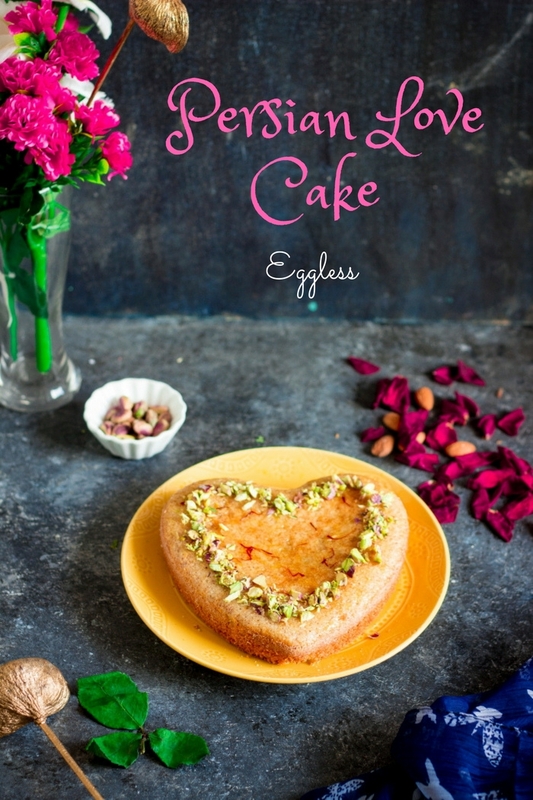 This Persian Love Cake and then the Almond brownies. 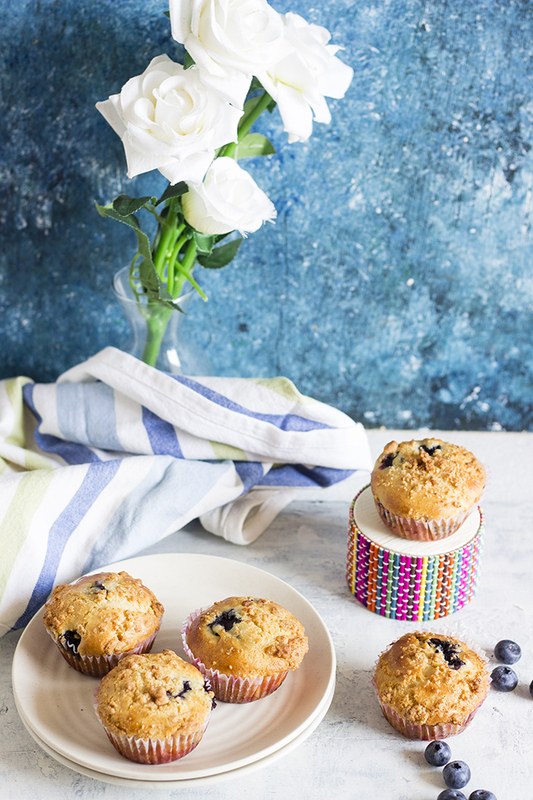 Eggless Blueberry muffins made using fresh blueberries and wholewheat flour. Streusel topped Blueberry muffins. 1. Mix together all purpose flour, whole wheat flour, milk powder, salt, baking powder and baking soda until combined. You can sift these too. 2. Whisk together melted butter, vanilla extract and 0.5 cups milk until combined. Add the apple cider vinegar and mix well. 3. Add in half the dry ingredients and whisk until combined without any lumps. 4. Add in the remaining flour and milk and mix until you have a smooth batter. 5. Fold in the blueberries. 6. Line a muffin tray with paper liners. 7. Spoon the batter into the liners until they are 3/4th full. 8. If making the streusal, mix together cold butter, flour, brown sugar and powdered sugar with your fingers until it forms a coarse mixture like powdered cookies. 9. Sprinkle the muffins with about 0.5 tsp each. Panaka or Panakam is a traditional Indian cooler popular during Summers in South India!! Panaka or Panakam is a traditional Indian cooler popular during Summers in South India. 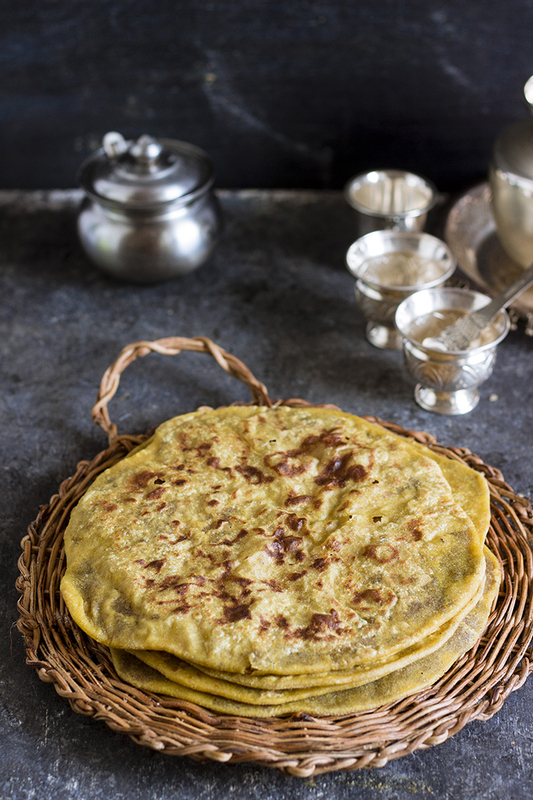 It is served along with spice buttermilk and a lentil salad called kosambri during the festival of Ram Navami. This was one of those posts with a writer's block. I did not want to write about the weather, I did not want to write about my memories or childhood. Nothing special happened this week either. So I was kind of lost. I started to write, then deleted it at least 3 times!! 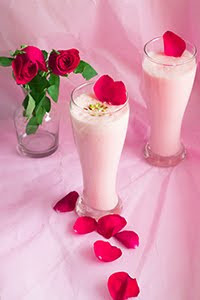 So now I have settled on just talking about the ingredients that make up this mocktail like drink called Panaka. Panaka is sweet, mildly tangy, warm with the ginger, earthy because of tulsi or holy basil and fragrant from the freshly ground cardamom. It is very similar to a lemonade but with different proportions. One of the main ingredients in Panaka is jaggery. Jaggery is unrefined cane sugar. The closest in texture is Muscovado sugar. 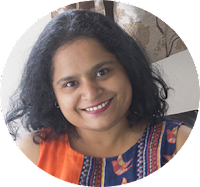 Jaggery has a complex flavor profile as compared to regular refined sugar. The darker the jaggery, the more complex the flavor. 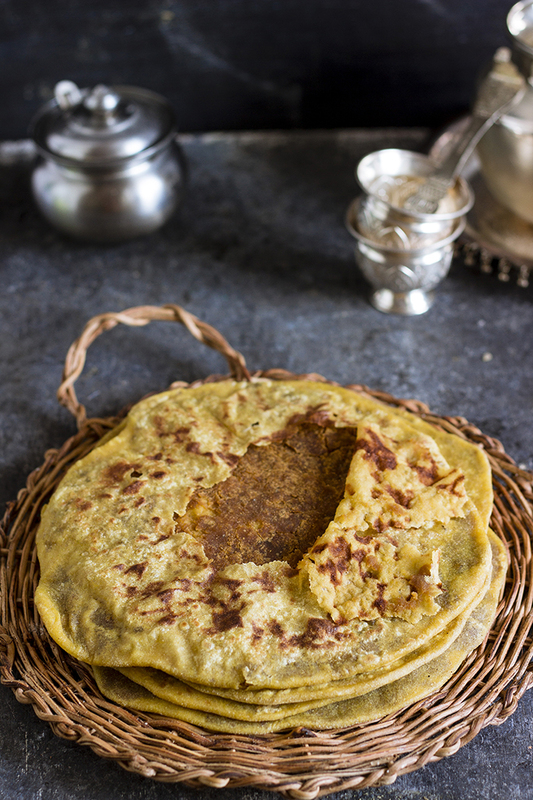 Dark jaggery is the least refined and purified, while the yellow jaggery has less impurities. With people looking for more organic stuff these days, the organic brown jaggery has become very popular. Ginger is added for its health benefits. It is known to cleanse the body of toxins. If you cannot find fresh ginger, you can substitute it with dry ginger powder . Ginger also adds an earthy flavor to the drink while making it mildly hot. Cardamom is the main flavoring agent. I used fresh cardamom pods that I lightly crushed with a mortar and pestle. You can use a store bought cardamom powder, but I highly recommend making it yourself. Tulsi or Holy Basil leaves are added for health reasons again. I did not have any readily available, so I substituted with home grown mint leaves. The squirt of lime is optional, but recommended. Some folks use a tamarind juice instead. You can add any souring agent, just don't let it get overpowering. Panaka is much milder than a regular lemonade. The predominant flavor is from jaggery and the cardamom. Panaka or Panakam is a traditional Indian cooler popular during Summers in South India. Crush the seeds of the cardamom until fine. Add the cardamom, grated ginger, powdered jaggery and juice of 1 lime to the water and stir until the jaggery has dissolved. Add the tulsi leaves or mint leaves. Eggless Vanilla cake with fresh pineapple pieces and a light whipped cream frosting!! Happy Birthday to the most important people in my life - My husband and my sister!! Coincidence? Divine plan? No idea, but the two most important people in my life share their birthday with each other. It was last week and they demanded this Pineapple Cake. Normally, I'd bake a chocolate since that's everyone's favorite, but a birthday girl/boy's wish has to be fulfilled. So Pineapple Cake it was!! The last time I made this cake was four years ago on my birthday and I almost swore I'd never make it again. I was a novice at frosting cakes back then and I messed it up real bad. First I tried to make the whipped cream frosting with low fat cream by adding butter to increase its fat content. I've heard it works, but in my case I ended up with a gloopy buttery mess. Then I found that there are lots of local dairies around that sell fresh full fat cream and I went in search of that. We had to check out several stores to find the freshest of the fresh lot. And to my back luck, I over whipped it and ended up with lots of vanilla flavored sweet butter. So you understand my trauma when the pair asked for Pineapple while I was trying to steer them towards anything that needed a ganache or a buttercream. So this time I bought back up packets of cream and guess what? All my back ups are safe in the fridge. I've finally learnt when to stop whipping the cream. My suggestion would be to use cream with at least 40% fat content and not fret about making this cake low calorie. Lets get real, this cake is a treat, and not a low cal diet eat, so close your eyes for once at the calorie count and just enjoy a slice of the delicious Pineapple Cake. The first time I made this cake, was also the first time I ever bought a pineapple. It is much simpler to use canned pineapple here, but I'm all about using fresh fruit when I can. So I learnt how to peel and slice a pineapple. While I'd have loved to use the fresh pineapple straight away, it ends up getting bitter after a while, hence, stewing it in sugar syrup. You will need to stew the pineapple a few days in advance, at least one day. I made the pineapple in syrup 4 days in advance and it turned out beautifully sweet and soft. The leftover syrup can be used in smoothies or juices to add a subtle pineapple flavor. Eggless pineapple cake with pineapple pieces and a whipped cream frosting. Skip these steps if you are using canned pineapple. Add the sugar to the water and heat until it dissolves. Lower the heat and add the fresh pineapple slices. Pour the pineapple and the syrup into a glass jar. Allow it to cool before closing the jar and refrigerating. Preferably, do this at least 1 day in advance to assembling the cake. I made these 4 days in advance. In a large mixing bowl, take the condensed milk, vanilla essence and oil. Whisk until combined. Add the powdered sugar and salt, mix until combined. Add the flour by the spoonfuls and whisk until combined. When it gets harder to whisk, add in a little milk. Continue until all the flour and milk has been combined. Do not over mix, the cake will end up hard. Grease two 6" round pans and line the bottom of the pan with butter paper or dust the pan with flour. Divide the batter equally between the two pans. Bake for 30-40 mins until done. Cool on a wire rack until completely cool before frosting. The cake can be made a day in advance and frosted later. Before making the whipped cream, place the whisk and a steel bowl (in which you will be whisking) in the fridge for 30 mins. Alternatively, place the steel bowl in an ice bath while whisking. Pour the cream to the cold bowl and whisk until you have soft peaks. Now add in the cornstarch, sugar and vanilla and continue to whisk until you get stiff peaks. Be careful not to over whip the cream, else it will turn to butter. Allow the vanilla sponge cake to cool completely. Level the cake as required. Spoon the pineapple syrup on both the halves. Spread a part of the whipped cream on the lower half of the cake. Cut the pineapple into small pieces and spread on the whipped cream. Place the upper half on the cake on top. Spread the whipped cream all over the cake. Decorate with the remaining pineapple slice.